It can seem like a tiny nightmare when you find out it’s your turn to host Thanksgiving dinner. How are you ever going to feed all those people and stick to a budget? Don’t worry. Believe it or not, it is actually quite simple to host a Thanksgiving dinner on a budget. All you need to do is follow a few, easy steps. The easiest way you can save money, and time, is to host a Thanksgiving potluck. The idea is that you prepare the main course (turkey, ham, roast beef, etc.) and each of your guests brings along a side dish or dessert. The only thing to remember is to have a list of what everyone is bringing so that you don’t end up with twenty gallons of mashed potatoes and little else. This step alone can cut your grocery bill down to less than $20. Even if you do decide to purchase everything yourself, you should avoid catering. Many grocery stores, restaurants and even fast food joints offer this service during Thanksgiving, but it comes at a cost. Not only will you paying a small fortune, but often the food isn’t as good as homemade. You will save quite a bit by making the meal mostly from scratch. This doesn’t mean you have to make homemade pies, but unbaked frozen pies are certainly more affordable than ones from the bakery. Take your time and see what items will cost less to make from scratch and which ones are worth splurging on to save money. Believe it or not, drinks can eat up a large portion of your budget, especially if you serve wine or other spirits. Fresh brewed tea, coffee and water are much more affordable. If you would like to serve wine, consider asking your guests to bring along a bottle when they ask if there’s anything they can bring. Once you have an idea of what you’re going to make, start shopping immediately. One of the easiest ways to stick to your budget is to buy some of the items you need each week. For example, the first week of November, the grocery store might have canned vegetables on sale for 3 for $1. The next week, you might find fruit pies on sale 2 for $5. Shopping early can lead to big savings. 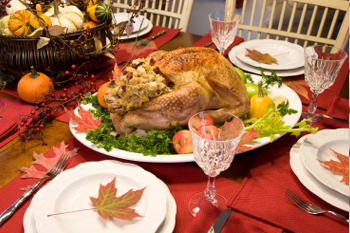 Hosting a Thanksgiving dinner doesn’t have to be a financial nightmare. Not only can you cut your costs by hosting a potluck, but you can also stick to your budget by avoiding expensive catering and sticking with simple beverages. Last, but not least, you’ll save big by shopping early. In other words, having the proper plan will ensure you stick to your budget. About the Author: Amy Brantley is a professional writer who enjoys sharing money saving tips for the holiday season.